A new twist on a classic and favorite cat toy. 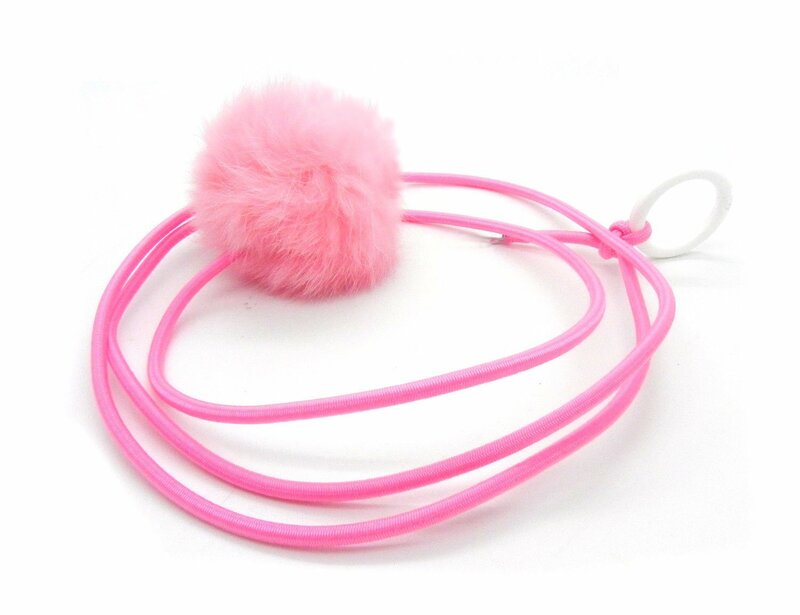 Our real rabbit fur pom poms on a string. These soft fluffy fur cat toys are attached to a elastic string with a plastic ring attached. Can hang them on a doorknob, or put on your finger and pull along the floor. Cats love to attack and enjoy the interactive play with you. Real rabbit fur Cat toy on a Elastic String. Natural rabbit fur pom pom come in Natural Gray, Natural White, Light Purple, or Light Pink. The soft fluffy pom pom is 2.5" in diameter. Elastic colorful cord is 36"long attached with a plastic ring. Great interactive toy for your cat. Supervise play recommend with these cat toys. The rabbit fur string cat toy is a big hit with Kukla the cat. She is extremely discriminating in her rating of cat accoutrements, and she gives this toy 4 stars. If it were a bit heavier and had more substance (not hardness), she would give it 5 stars. But she loves to chase it, catch it and claw it; and it satisfies her instincts for real prey. As in indoor cat, she appreciates virtual hunting with overtones of reality.